An in depth look at the motive power history of this US Steel road. The roster contains Alco, Baldwin, and EMD switchers and six-axle roadswitchers working in unison with a fleet of F units. 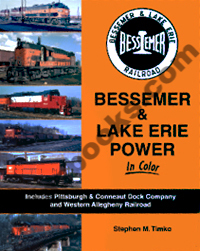 Includes the Western Allegheny Railroad and Pittsburgh & Conneaut Dock Company.